We woke up to snow yesterday! last week the temps were near the 70s! So, today is cold and, I decided to set a table to convey some warmth. 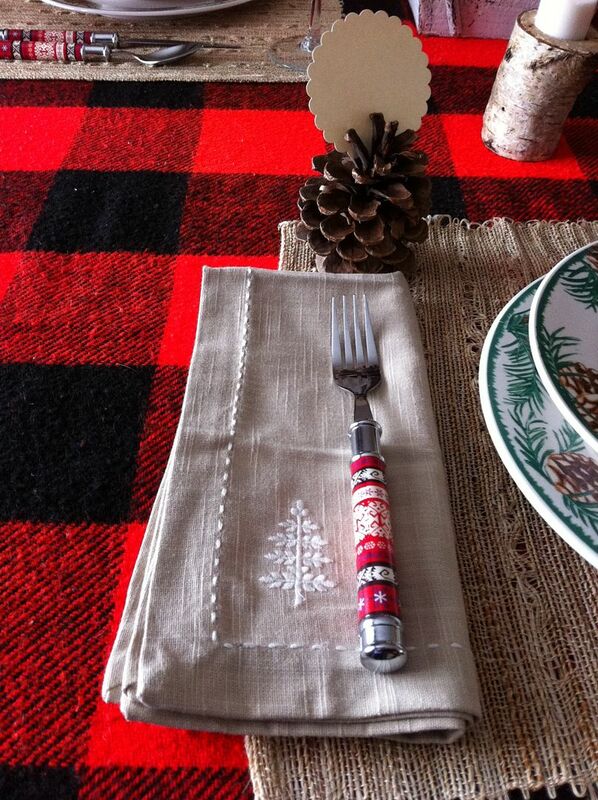 I started with a wool red and black checked stadium blanket as the tablecloth. Next came a burlap placemat. I purchased the dishes some time ago online from Boscovs. They were clearanced at some ridiculous low price for the 8 piece set. 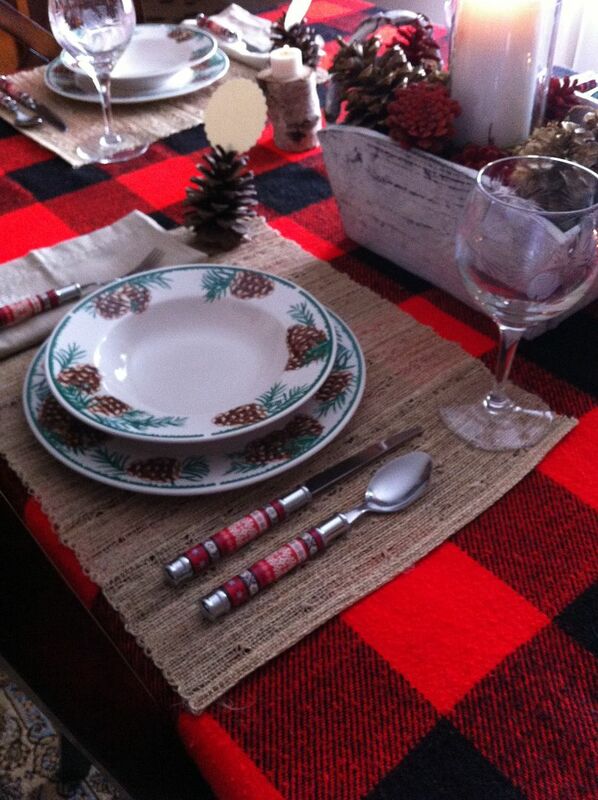 The pinecone motif became my theme for the table. 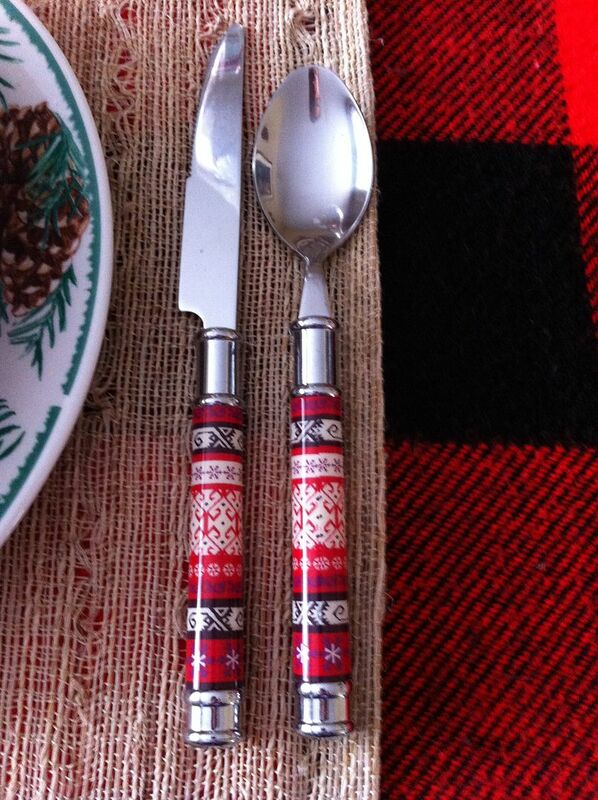 My friend Cuisine Kathleen has the same set of flatware from World Market. Mine were a stocking stuffer from Santa. As were the embroidered napkins. The goblets are one of my very favorite thrift store finds! I got 6 of them for $3.00. They are etched with pinecones and pine needles. For the centerpiece, I used another thrift store find. A worn wooden basket with handpainted pinecones and greens. as well as a few red pinecones I had in my craft stash and added a tall candle for height. So pretty with the goblets don't you think? Rustic and elegant on the same table. On each side of the wooden basket are birch votive holders. These are very special to me. for the tables at his and his beautiful bride's wedding reception. They very sweetly sent me some to use on my tables. 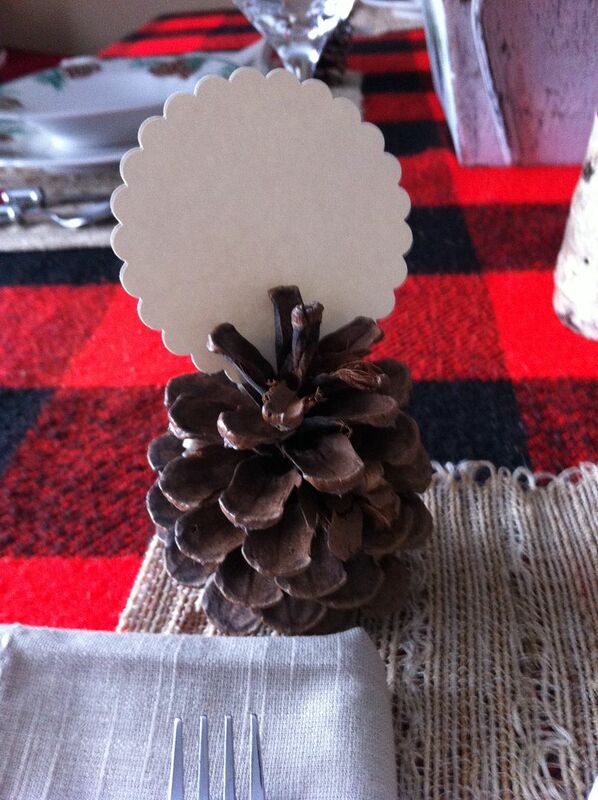 More pinecones were used to hold name cards. 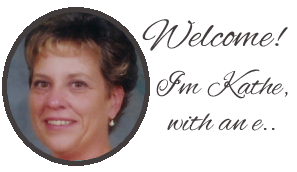 I left them blank so that I can add your name should you decide to join us for dinner. Supper will be warm and hearty beef stew, rustic homemade bread, salad and bread pudding topped with cream for dessert. I love this table! The pinecones are excellent. So warm and cozy looking. 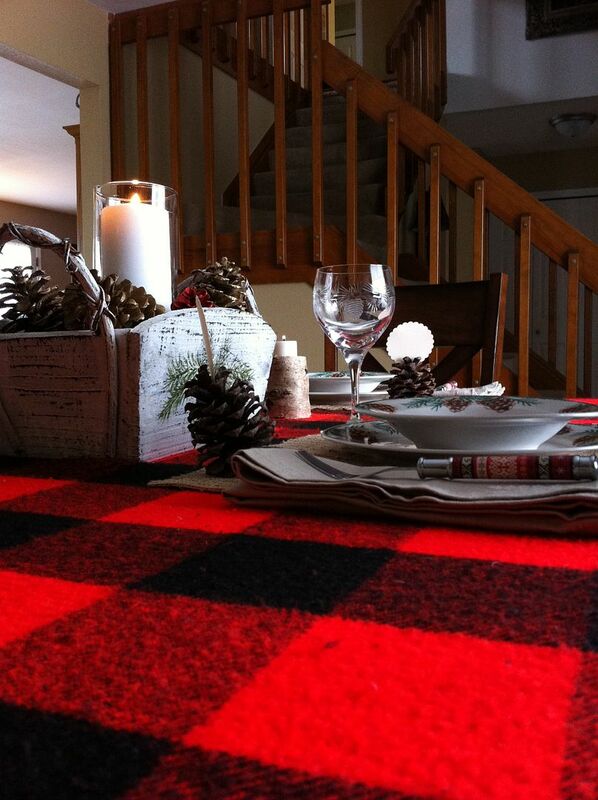 I love buffalo plaid on the table! 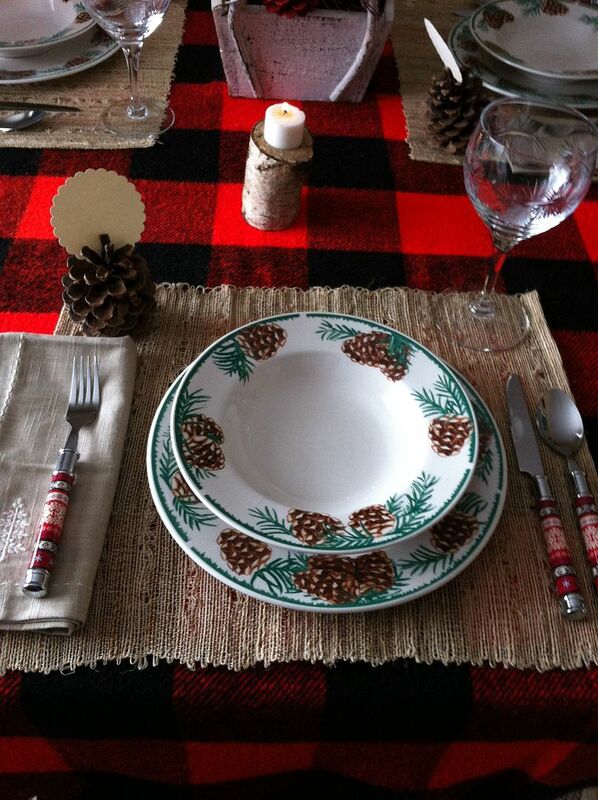 So fun with the pine cone dishes. 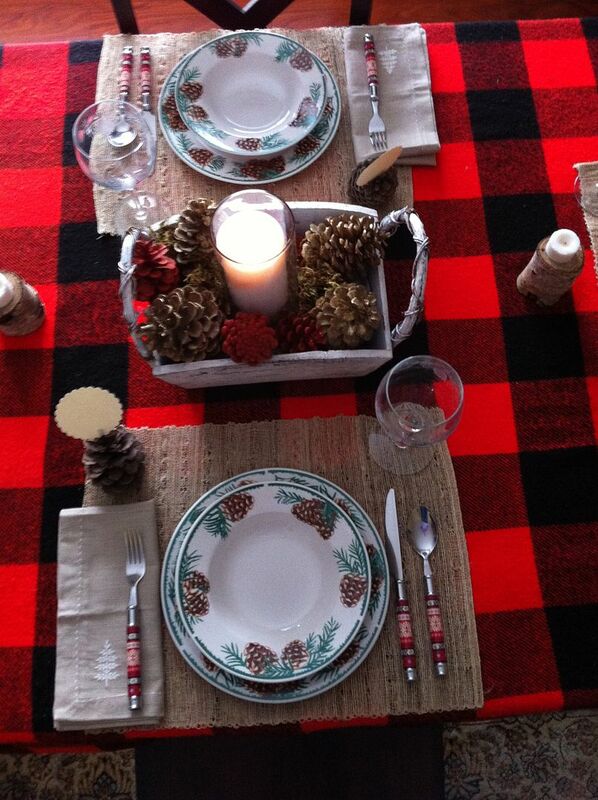 What a fabulous table...love the buffalo plaid tablecloth. 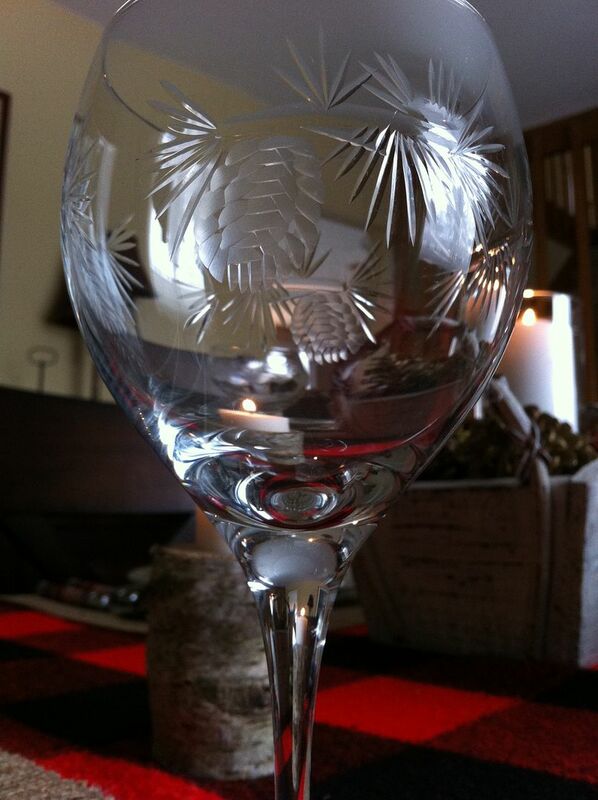 The stemware is making me drool...I have pine cone dishes they would look great with. Crazy weather all around. Ours has gone from cold to 80 to cold and back again. For your snowy moment, it looks like you've captured the right spirit for your table. That WAS incredibly sweet and thoughtful of your son and daughter-in-law to gift you with those neat votive holders! Your son did a good job on them! This table DOES convey warmth, Kathe! Nothing says warmth like that cool black & red flannel!!! We have experienced weather conditions like you: in the 70s on Monday, in the 20s with ice, snow and blustery winds today. Today's weather would certainly warrant a warm, welcoming table like this one!!! Have a great weekend! I don't know if you're planning to watch the Super Bowl, but if you do...enjoy!!! You always have the prettiest table settings. I love the pine cone theme, and you found some great thrift finds, love those glasses. It will only be 11 degrees here tomorrow, and this would be a perfect setting for our area. I wanted to also say thank you for offering you condolences on the passing of our beloved Bo! I hope you won't have to go through this with Max anytime soon. I almost feel bad looking forward to spring, when we really haven't had a ton of winter weather. Your table is just so warm and cozy! Everything works beautifully together. That stemware is gorgeous! If there is still room at your table, count me in! The perfect rustic tablescape for winter. Great finds. Lovely! Kathe you have set a gorgeous table! Love the dishes, flatware and those glasses!!! 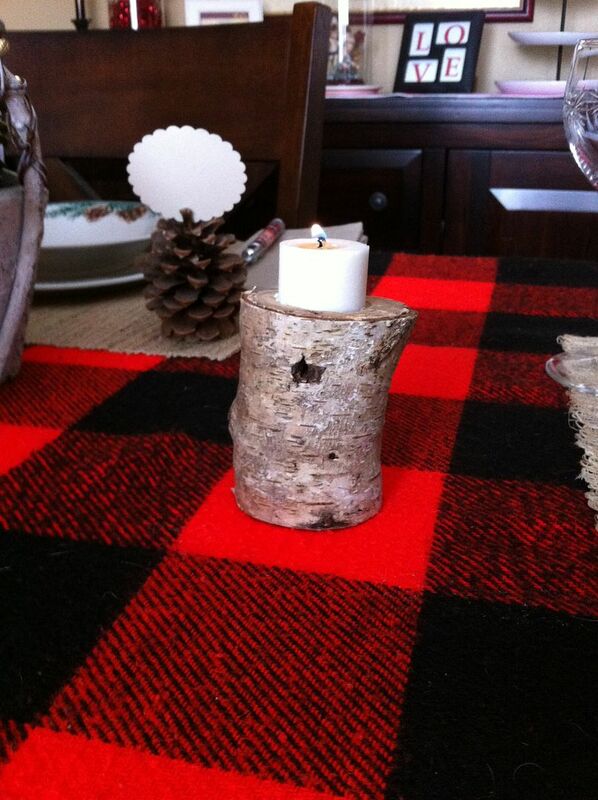 The birch votive holders are so pretty and how sweet of your son to send you some. I think you did a fabulous job. Hold one of those places for me also will you? I have never been to Colorado but think I just might have to make that trip to meet you one of these days! Very cozy and inviting. You had me at pinecone. I have a weakness for them. This is really pretty! I would have never thought to add the fleece blanket as a tablecloth. So nice and warm! Wonderful! I love the warm and rustic feel. I never would have thought to use a blanket as a table cloth! What a cozy table. I'm all snuggly warm just looking at it! oh so pretty ... def warm & cozy feel! Kathe, Beautiful table setting! 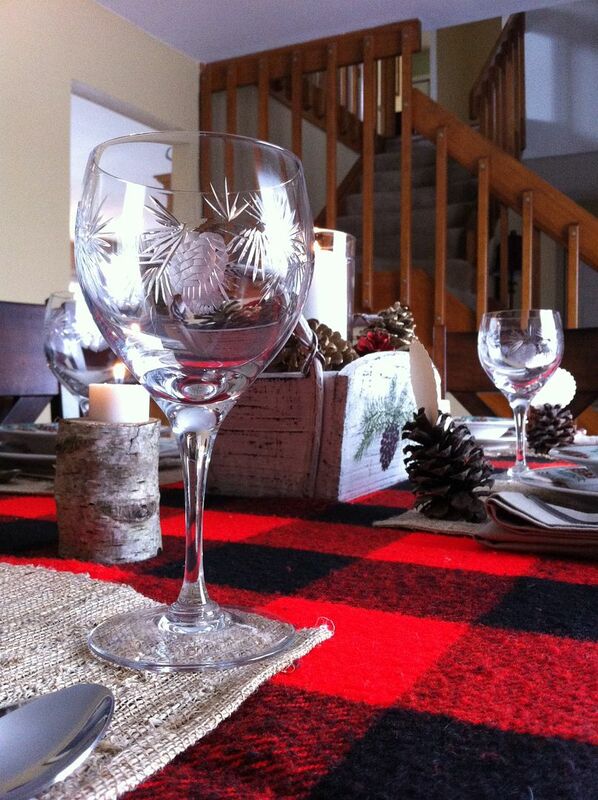 I love the plaid blanket and pine cones everywhere, very inviting! Thanks for sharing at Simple & Sweet Fridays. Kathe you set a beautiful table. 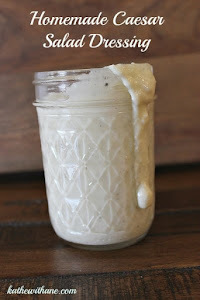 I love the flatware!Hugs and thank you for sharing at Thursday Favorite Things :-) P.S. The new giveaway started today! Your tablescape for this week is beautiful love all your great finds. I hope you have a wonderful weekend with your family. I love your tablescape!! 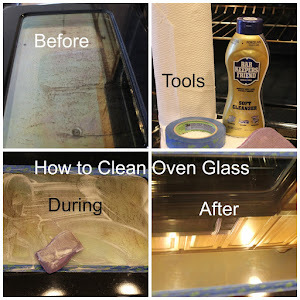 Especially your dishes and were surprised to see that you bought them online from Boscov's!! That is a PA owned store chain!!! The local one is 10 minutes from me!! LOL!! 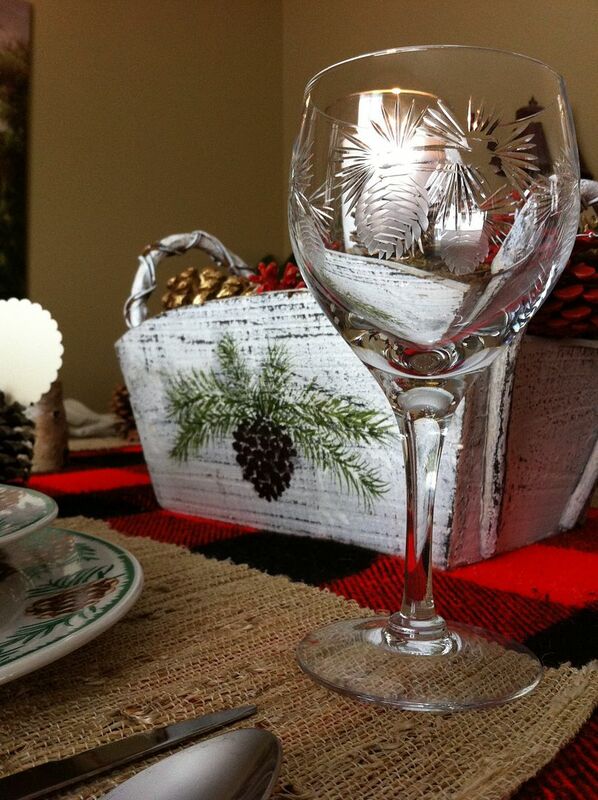 I love that pinecone basket you found i n a thrift store - it is perfect for your dishes and goblets!! Set off by the Buffalo plaid it all looks great! 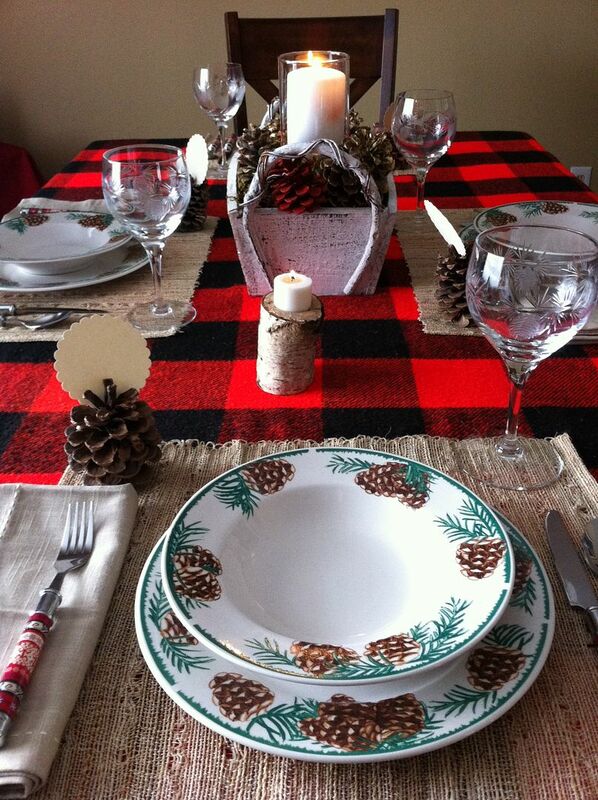 Kathe, love the buffalo plaid and your pinecone dishes. Who wouldn't want to snuggle up to this cozy table! What a cozy and warm table Kathe! The goblets are an awesome find! I have never seen that flatware. Very unique. I have a large birch candle I made years ago. You set a lovely table my friend! Thanks for sharing with SYC. I lovr this! I just had to pin it!! It looks so warm and cozy. 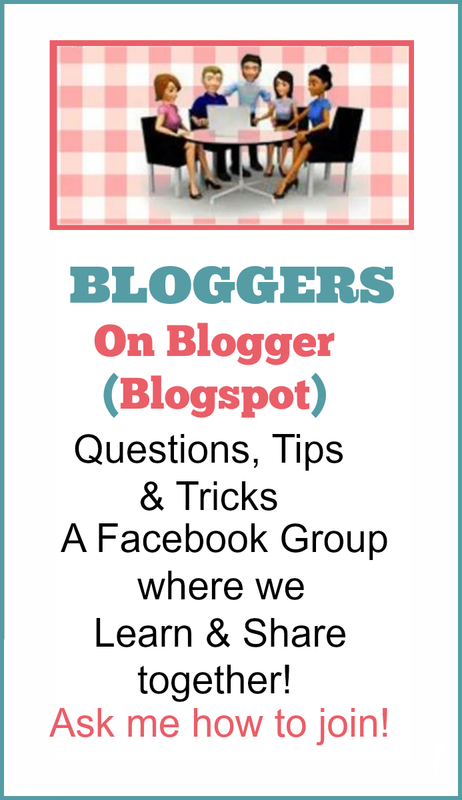 New follower here (from the Creative Monday blog hop) on your blog as well as Pinterest! It's beautiful Kathe! I'm on my way, so get those place cards filled out. Love the rustic and elegant combo and the birch candle holders with sweet sentiment. And using the stadium blanket was a fabulous idea for bold color and texture. 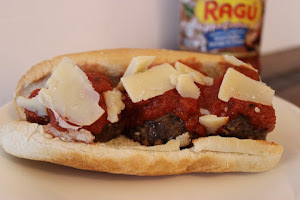 Thanks for linking up at A Humble Creation's Monday Makeover! What a cozy winter table! I love the dishes, and the flatware goes well with everything! 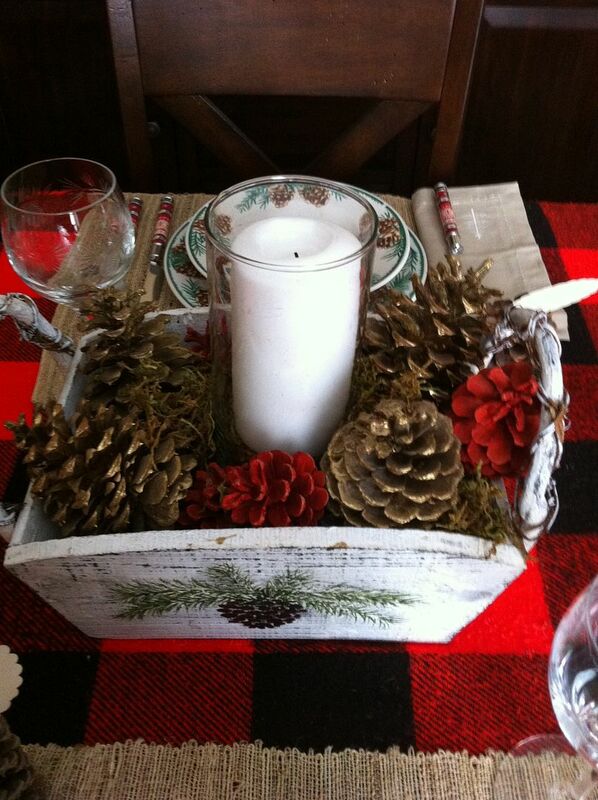 Love your rustic centerpiece too! I had to laugh at the first line in this post because the EXACT same thing happened with the weather here in Illinois! Glad to see you took advantage of the cold weather and made something creative Stopping by from Frugal Crafty Home--thanks for linking this up! Lovely set up - looks welcoming and warm! Kathe, Your table settings always inspire me. I love your flatware. I got the matching serving pieces for Christmas too! What a perfect winter table! It is so "lodge-like" and feels warm and cozy. I really like this table a lot! Oh I love it! Who wouldn't want to sit down to a meal at this table. Lovely table!!! I always enjoy your posts! Thanks so much for taking the time to stop by each week!